This yummy appetizer is quick, simple and perfect for any party! 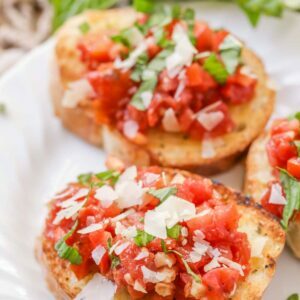 This easy Homemade Bruschetta Recipe only requires 5 ingredients!! Everyone loves how easy it is! Put all ingredients in a bowl and mix right before serving. Keep refrigerated until ready to serve. Scoop bruschetta onto slices right before serving.